About three decades ago I stopped using a stencil and a Rotring pen to create chemical structures for publications and started using ChemDraw on a Mac, at the time it transformed the standard of structures in publications and it has continued to set the standard for publication quality chemical structures. Over the years the software has developed and moved into cheminformatics, spectroscopy and more recently biological drawing. This lead to the rebranding as ChemBioDraw but most of the chemists I know still call it “ChemDraw”. So it is perhaps not surprising that I feel rather pleased that the iPad version is entitled simply ChemDraw. This is also perhaps a notable point in time that an application like ChemDraw that has had such a seminal role in chemistry desktop publishing should now be available on the iPad, mobile computing is now certainly mainstream. 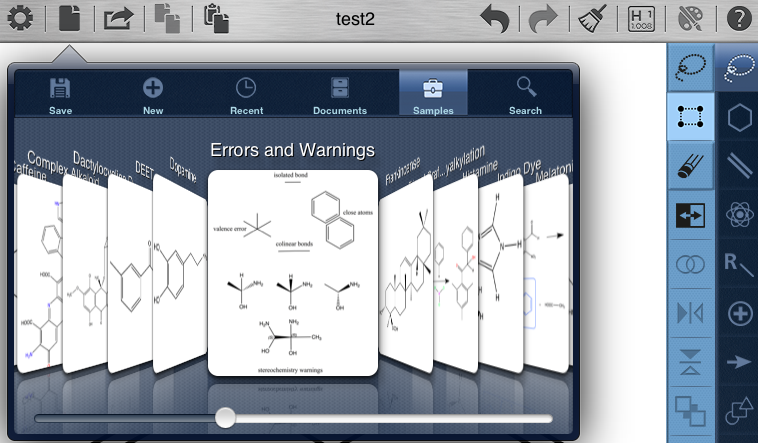 ChemDraw for iPad is now available on the iTunes App Store. Once installed simply tap on the icon to start up the application. One of the challenges of mobile applications is to create an interface that gives rapid access to all the options without cluttering the screen with a bewildering collection of icons. ChemDraw does this very nicely with two sets of icons on the right hand side of the screen. The rightmost icon set (black background) allows the user to select which tool set is displayed in the adjacent column of icons (blue background). This arrangement allows the user to navigate very quickly and will be very familiar to regular desktop ChemDraw users. I tried drawing with both finger and stylus and both worked fine. Constructing complex structures was very easy, the R- icon gives access to a wide variety of functional groups but as far as I can tell it is not possible to add your own templates, fusing rings, and building spiro centres all work as expected. All the stereochemistry tools are available and I was delighted to see that if you change the charge on an atom the degree of protonation corrects automatically. There is no option to apply a stylesheet such as ACS, so that would need to be done using the desktop application. Whilst you can copy and paste within a ChemDraw document I could not paste into a document created by another application. The open dialog gives access to a library of sample files and you can scroll through these using the familiar screenflow viewer. The default file format is cdxml and most objects in a CDXML document can be displayed in the ChemDraw app. The exceptions are tables, TLC plates, GEP plates, spectra, stoichiometry grids and certain BioDraw shapes. You can use the ChemDraw iPad app to draw and edit chemical structures, arrows and a number of simple shapes. Multi-attached atom labels with several bonds attached to various different characters within a label are also currently not implemented. I also tried sending an email from my desktop using files in both .cdx and .cdxml format and they both opened fine on my iPad as did .mol files. There is no option for other file formats such as sdf, SMILES or Inchi. One of the key features of mobile applications is the need to be able to share documents, not only with your desktop machine but also with other scientists, currently ChemDraw for iPad offers two options, email in which the currently displayed file is embedded in an email message. This works very nicely and opens up on my desktop machine using ChemBioDaw. There is also a new application Flick-to-Share which I’ve never come across before, this is a proprietary system developed by Perkin-Elmer to allow sharing files among users. I’ve never used this and since I don’t know anyone else who has access so I’ve added the published information below. Flick-to-Share is a revolutionary new way to share files quickly within existing applications. Built to leverage the collaborative nature of mobile devices, Flick-to-Share allows colleagues using the same app to share a work-in-progress with the flick of a finger. Today mobile app users must resort to email, cloud-based services like DropBox or cumbersome device-to-device sharing protocols to enable sharing. With the Flick-to-Share service embedded in an app a user can tap an icon to enter sharing mode, select a colleague from one of three targets on the edges of the device and flick the file to that target. Instantly that person will receive the file whether she is across the room or on the other side of the world. Sharing is a snap. ChemDraw and Chem3D are the first two apps to leverage this technology to share native files between a pre-selected network of collaborators. Within the lab setting scientists are always scribbling notes and passing ideas back and forth during the creation of new compounds. With Flick-to-Share embedded into the premiere tool for drawing chemical structures, these ideas can be digitized, captured, and efficiently shared with fellow researchers any where in the world. Flick-to-Share really shines in the classroom setting. During a class students can flick molecules to the instructor, get feedback and then have the finished molecule sent back. Instructors have the freedom to walk around the classroom while projecting images from their iPads via Apple TV and simultaneous engaging with each student. Classes will become more interactive as molecules zoom around the room.The power of Flick-to-Share lies in its simplicity. Accessing your contact list, you can quickly find or invite people to join your network. Using natural gestures of the iPad, swiping your finger to share a file with a friend just feels right. And seeing it animate away from your finger to your colleague makes sharing fun. This sounds an interesting system, which could be very useful in a class environment, I don’t know about the security so I should avoid sending confidential data in this manner. I don’t know if this will be opened up for other applications but perhaps DropBox integration might be implemented in the future. Interestingly while you can’t save to DropBox you can open files in the DropBox folder. I just noticed that there are a couple of updates on my iPad, in particular ChemDraw and Chem3D for iPad have both been updated. What is particularly appealing is that they certainly seem to be listening to their users with several of the top requested features now be incorporated. I’m particularly delighted to see DropBox fully integrated as a sharing capability, for a mobile device this is absolutely critical. Perhaps unsurprisingly social media outlets (Twitter and Facebook) are now also supported. At the moment you can upload CDXML, PNG or PDF file formats, and you can only save to a ChemBioDraw folder within DropBox. The ability to add text boxes to structures and schemes will be very useful, and the ability to use a template will aid updating publications on the go.